Since WordPress 3.1 you may have noticed that WordPress automatically adds a toolbar at the top of the screen that allows for quick access and editing to certain useful admin options. You may love this feature or absolutely hate it for various reasons, if the latter don’t worry YES you can turn this feature off. 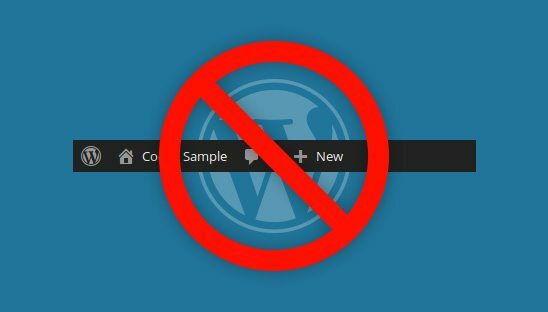 In this tutorial we will teach you two very easy methods for removing the WordPress Admin Toolbar. What is the WordPress Toolbar? The first method is the best option if you have multiple admins, where some want to utilize the WordPress Toolbar while others don’t. This option allows you to turn the WordPress Toolbar on or off based on specific users. To turn off the WordPress Toolbar for the current logged-in user, simply go to Users > Your Profile in the WordPress Dashboard then scroll down to “Toolbar” and uncheck “Show Toolbar when viewing site.” You may also manage other users profiles if you are a top level admin with permissions to do so by going to Users > All Users and editing the necessary profiles in the same method as the logged-in user. The WordPress Toolbar will now be removed from the front-end of your site based on your edited settings. The second method is to completely remove the WordPress Toolbar from all users by adding a PHP filter to your WordPress Functions file. Simply open your functions.php file then copy and paste the code below. The WordPress Toolbar will now be completely removed from the front-end of your site. Only try this method if you are familiar and comfortable with editing WordPress theme files otherwise refer back to Method 1 of this tutorial.